The majestic Gannets with their six foot wing span are a familiar sight plunging into the sea around the coast. Another group of birds which plunge into the sea in pursuit of fish are the Terns. These dainty looking gulls with their forked tails hunt close to the shore. They are some times referred to as Sea Swallows. There are three types regularly on Arran. This year, Sandwich Terns have been recorded in numbers. There have been a small number of sightings of Arctic Tern, but there have been none of Common Terns. Sandwich Terns are a little larger than the other two with long wings and short forked tail. They have black legs with a black bill with a yellow tip. Their black crown can often look shaggy. They fly with strong deep wing beats. 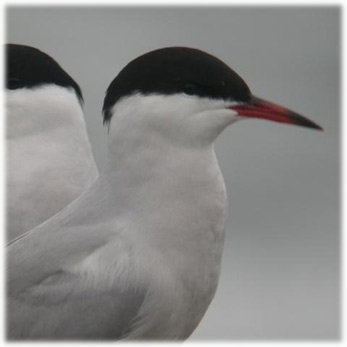 The Common and Arctic Terns are very alike. They both fly with shallow, graceful almost buoyant style. They are hard to tell apart so much so that some people take a bit of both names and refer to them as “Comic” Tern. It is easier to tell them apart when they have landed. The Common Tern has red legs and a red bill with a black tip. ( See illustrations) The Arctic has shorter red legs and a completely red bill. north as the Arctic Circle. This is said to be the longest migration of all bird species. The next time you see them, think of their annual journey.